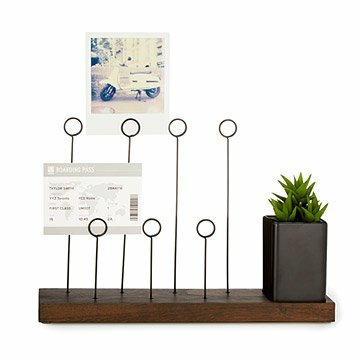 Gather your favorite photos together on this stylish picture holder with a built-in succulent pot. What memories make you the happiest? Familiar, smiling faces? Ooh- and ahh-worthy vistas from your travels? Or maybe quiet moments close to home? Gather and display those moments in your office or home with this collage-inspired design, which features a handsome, walnut base and seven wire picture holders. The split ring design holds photos securely without damaging them. To the side is a ceramic container that can hold succulents, pencils, or perhaps a favorite memento. Designed by Sung Wook Park. Made in China. 12.25" L x 3" W x 8.25" H; Cup: 4: dia. I loved this product so I bought another one! This was a great gift for two of my kids wedding anniversaries this past March. Add a plant, tickets and or gift cards, TY note, my card and those of other local service pros, for a closing gift to new home buyer. Love having this item on my desk. Use the "planter" as a pencil holder. Have both photos and other notes displayed. I love this for my desk! I use it to put motivational quotes and pictures on my desk and it really saves room if you want to have a lot of pictures on your desk. Only con is that the wood around the plant pot was chipped, but you can't really notice once the pot is in place. This was a going away gift I gave to two of my friends. For the money, it was really nicer than I even expected. It makes a perfect accessory for a desk because it is quite useful but doesn't take up a lot of space. Great card holder. Nice to have them on display.